The second child of Lady Di and Charles will marry this May. I am reminded of their eldest son's wedding as I happened to be living in England then. 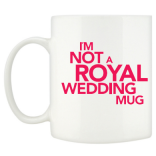 There were lots of royal wedding swag the in shops leading up to the big day, but also some 'counter-swag', if you will. Much of the anti-royal wedding stuff I discovered on the day itself. On the 29th of April, 2011, Will and Kate were married in London. Of course, by "Will and Kate" I mean Prince William of Wales and Miss Catherine Middleton (formerly of party supplies). I attended one of these events. Care to guess which one? The anti-Royals came from all over the UK to protest what they see as an outmoded system that must be dismantled. "Citizen not Subject" was just one of a handful of bumper-sticker phrases I saw emblazoned on t-shirts, mugs, and fliers available at the info. tables set up amid musicians, face-painters, and food stands. "Yeah, but how could the monarchy be dismantled?" "If I had a quid for every time someone said that to me..." was what M., one of the organizers of the party, said to me in response. Not yer queen's tea mug! By the end of the fete, I still didn't have the answer to my question. I did, however, get to see many people come together for a day of relaxed, good fun. This shot gives the expression "Young Republicans" a whole new meaning, thankfully. Of the two events I know which one I would prefer (by a country mile). And no need for security of uncomfortable shoes either. security OR uncomfortable shoes. Pardon my dyslexic fingers. And I loved the crack about young Republicans. It rained a bit, but I had a hooded sweatjacket. Good times. I read it as 'or'. Glad you liked the Republican crack!